Number 1 magazine went on strike in June 1984. It wasn’t published for seven weeks. Frankie Goes To Hollywood’s second single Two Tribes went straight in at, er, number one, just before the staff downed tools. By the time they returned to work it was still in pole position. During this period Relax had climbed back up the charts and was in second place for three weeks. This was unprecedented stuff. So was the way I was purchasing music. Everything changed in June 1984; it was now not enough to own one version of a release. Over our wall was a big garden with potatoes and strawberries in it. They needed pickers. Two Tribes was released at the height of the nuclear warfare fears. The Cold War was in full swing. It came out in seven different formats during those two months. I bought all of them. 7″ (Cowboys and Indians). The radio-orientated production that dispensed with a section of the song’s middle eight. 7″ (We Don’t Want To Die). A picture disc. More guitar-driven. Has the middle eight. 12″ (Annihilation). Starts with an air-raid siren. Features actor Patrick Allen recreating his narration from the Protect and Survive PIFs. A total deconstruction of the track complete with grim tips on how to dispose of dead bodies that had built up in the fallout shelter. 12″ (Carnage). This followed the standard instrumental – vocal twelve inch blueprint. Halfway through saw a few vocal samples; more Patrick Allen and excerpts from the One February Friday (interview b-side). Chilling and my favourite. 12″ (Hibakusha). This was the hardest to get. 5,000 copies only. Heavier percussion. 12″ War. A cover version of Strong-Whitfield’s War was the main b-side. A remixed version subtitled (Hidden) became the a-side with the Carnage mix on the flip. Cassette (Keep The Peace). Features elements of all mixes along with previously unused Reagan samples (voiced by Chris Barrie) and interview clips not used elsewhere. Just like the year before, 1984 was a long hot summer. 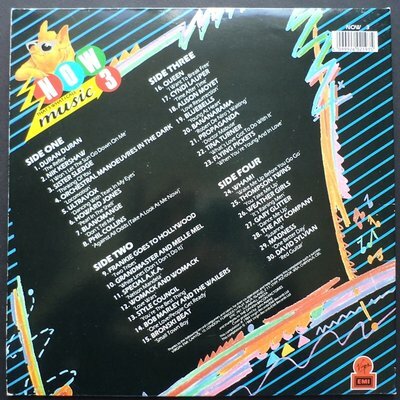 The third volume of Now That’s What I Call Music was released on 23 July and is the first to feature the classic logo and the pig. As compilations go this is immense stuff and only beaten by its predecessor. It topped the album charts for eight weeks. Let’s start at the top. 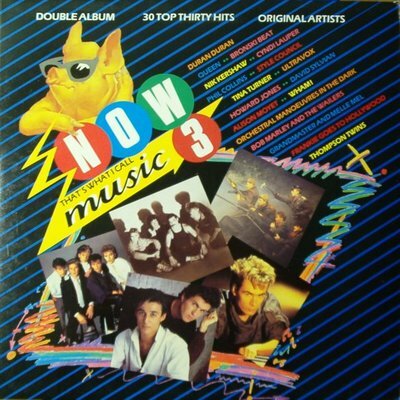 Just four songs had reached number one since Now II and three of them are included here – The Reflex, Wake Me Up Before You Go Go and Two Tribes (We Don’t Want To Die). Missing is Lionel Richie’s Hello but that would appear on the next volume. While Wake Me Up is probably my least favourite Wham! song, The Reflex is a stormer and works really well as an opening track. The single version also has a lot more going on than the Seven And The Ragged Tiger take. Side 1 passes by very smoothly. Nik Kershaw’s third consecutive hit (keep off the top by Two Tribes), Sister Sledge’s immaculate disco sheen and Blancmange’s enigmatic Don’t Tell Me. Howard Jones’ Pearl In The Shell is a more complex track and I think Hide And Seek would have fitted in a little better. Another silver medallist – Phil Collins – brings the first quarter to a downbeat finale. Also reaching number 2 during that mid-year period was You Take Me Up by the Thompson Twins which is a nice antidote to Wham! on side 4. Three of my favourite tracks are all on the second side. Two Tribes, the triumphant soul of You’re The Best Thing and rap classic White Lines (43 weeks on the chart!). The Special AKA had already appeared on K-Tel’s Hungry For Hits along with It’s Raining Men and Time After Time. It concludes with two songs that are indelibly associated with the end of primary school – Bob Marley’s plaintive One Love and Bronski Beat’s corking debut Smalltown Boy. Tina Turner’s What’s Love Got To Do It was everywhere that summer while Gary Glitter’s Dance Me Up now feels oddly creepy when played back today. However it’s the leftfield choices on Now 3 that are particularly inspiring – most notably Propaganda. Dr. Mabuse is an inventive masterpiece that I only really appreciated a couple of years later. Having Madness and David Sylvian close off the fourth side with two languid and “serious” tracks is a masterstroke by Ashley Abram. Elsewhere the second record keeps the pop flag flying with Alison Moyet’s affecting Love Resurrection and Bananarama’s cinematic Robert De Niro’s Waiting. A 20 track video selection was also released. Just eight of the songs actually appeared on the double LP. The remaining dozen are a motley bunch ranging from chart failures (Farmers Boys, Loose Ends, Thomas Dolby and Working Week) to genuine contenders like Mighty Wah! with their stirring Come Back and The Blue Nile’s sweeping Tinseltown In The Rain. Kool and The Gang – (When You Say You Love Somebody) In The Heart. A worthy follow-up to Joanna. Deniece Williams’ Let’s Hear It For The Boy (another #2 hit – eventually ended up on The Hits Album). Elton John’s Sad Songs (Say So Much). Kept hearing this on the beach during July and August that year. A Human League track – The Lebanon or Life On Your Own. Lionel Richie’s Stuck On You. Country twang. Scritti Politti’s Wood Beez or Absolute. The former is on both the Now 10th Anniversary 1984 and Now Millennium Series 1984. Spandau Ballet’s Only When You Leave. They had a great 1984 with four brilliant singles pulled from their finest LP Parade. None of these were compiled at the time. An apt way of describing Dance Me Up. If forced to pick I’d have Sad Songs (Say So Much) in its place.